An applet to provide quick access to a variety of cheat sheets. What does this applet do? Cheaty is a quick way to access various cheatsheets from within the a single cinnamon applet. Click on the applet and a drop-down menu of cheatsheets appears broken into sections on each topic and items describing the topic and code that is copied to the clipboard when the menu item is clicked. What's here at the moment? 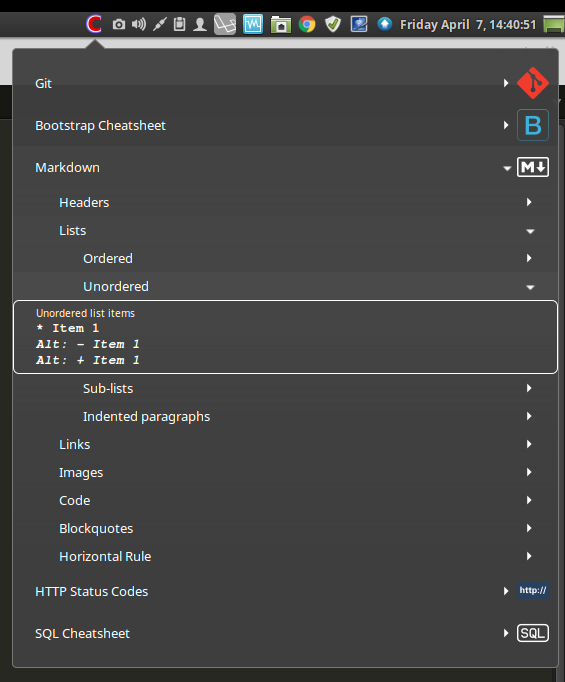 Currently, there are 5 cheatsheets that come with Cheaty: Git, Twitter Bootstrap, Markdown, HTTP Status Codes and SQL. Can I add my own cheat sheet or maybe contribute cheat sheets to this applet? Totes. There's a template.json file in this project. If you have an SVG icon for the topic, then stick it all in a folder in the refdocs area (or whatever folder you setup in the configuration of the applet). You can use the existing cheatsheets as a reference. There should be. Open to suggestions on that. But why is this a thing? Because I keep forgetting how to Markdown. And also, some Git stuff. Wunderfull idea! I used several Websites to look for this and that cheat. Now its in one app. Great! This is a great idea! But taking in consideration that most of the Cheat Sheets out there are in PDF or some kind of image format like JPG, PNG. I would consider a software like this that can keep PDFs and search them also! This is a really really great app! Thank you! It's been installed for 10 minutes and I've already used the heck out of it. Thanks so much! Really great and wonderful idea, please keep it updated!!! !